This entry was posted on Tuesday, May 15th, 2012 at 8:20 pm	and is filed under Tips & Techniques. You can follow any responses to this entry through the RSS 2.0 feed. You can skip to the end and leave a response. Pinging is currently not allowed. 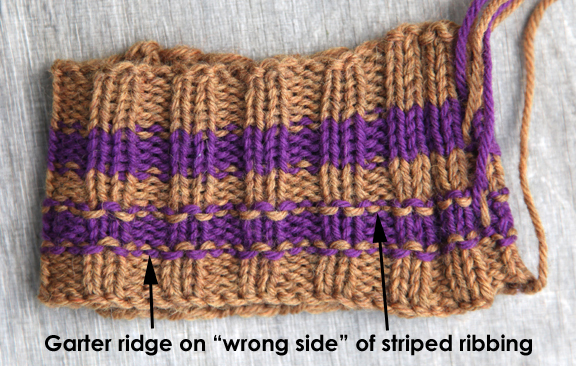 So, in the second picture, showing the back (purl) side, the first stripe shows the purl zig-zags, but the second one doesn’t. How’d you do that? The second photo is the same swatch looking at it from the “wrong side” or inside of the tube. 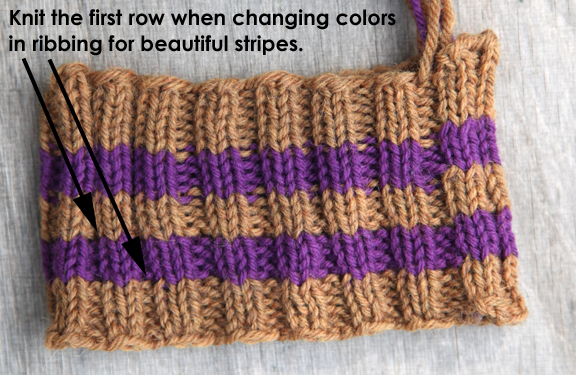 The second (bottom) stripe in the second photo is made when you knit (on the right side) all of the stitches in the row/round when you change colors. Right. But the two stripes look the same on the right side; it’s only on the wrong side that they’re different. Thank you for this tip. It will come in so handy this summer when i start on my kids’s winter hats and mittens. The top stripes in the first and second photos look the same. You can see the zig-zagging line Liz talks about best in the second photo since the ribbing is stretched out more. The purl columns is where you see two colors overlapping each other, creating a messy looking stripe. Thank you so much, Liz. this solves a problem that has bugged my many times. Nice! Will definitely use this technique.